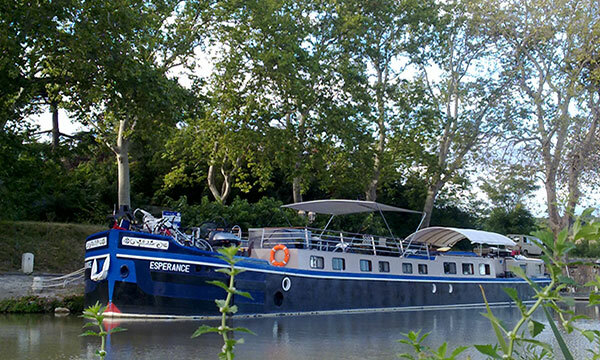 Travelers can now discover and explore the heart of France’s most popular wine region by barge, as the Tango is now cruising the waterways of Bordeaux. With its authentically French style and contemporary appeal, the Tango effortlessly resonates with Bordeaux’s charming balance of historical relevance and modern attractions. 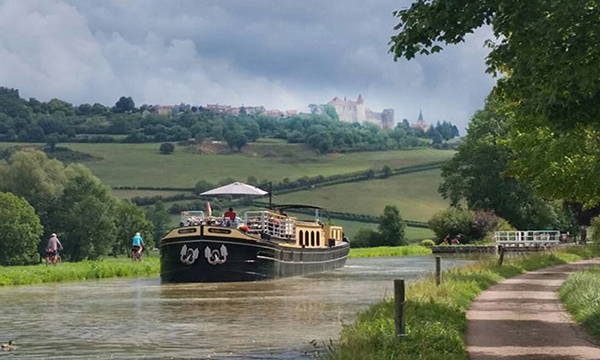 Add the sumptuous onboard cuisine, world-class winetasting, and delightfully Continental ambiance for a barging experience sure to please wine enthusiasts, foodies, and Francophiles alike! Tango is operated by Captain Daniel Sak, a second- generation barge owner whose mother debuted the barge Fandango and operated it for many years. Daniel’s history with Tango is quite amazing. The barge was built in 1931 and used to transport grain between Atlantic and Mediterranean ports; when commercial barging ceased in the 1980’s, Tango was retired in a small canal-side village. As a child, Daniel had seen the abandoned barge when navigating the French canals with his mother. He always said it was the only barge he wanted to own. In 2000 that dream came true when Daniel purchased Tango and lovingly converted her into a deluxe floating hotel carrying up to eight guests. Captain Sak, a graduate of the prestigious French National Cooking School in Burgundy, personally conceptualizes all of Tango’s culinary experiences, including wine pairings and ingredient sourcing. Tango’s gourmet Chef welcomes passengers with an interest in cooking and will enthusiastically share recipes, techniques, and philosophies on fine dining. All meals prepared aboard Tango are made with fresh and seasonal market produce bought daily, the best quality meats and poultry from area farms, and fresh Atlantic seafood and fish. Inspired by the nautical beauty and lavish comforts of passenger liners from the 1930’s, the Tango’s décor features large brass portholes, French art deco fixtures, Provençal ivory linens, and rich teak wall paneling. Tango’s spacious common areas provide the perfect spot to relax and socialize while enjoying a glass of Bordeaux wine. Most unusual is the lavish use of beautifully glazed Provencal tiles on the deck and in the gorgeous bathrooms. Tango’s route begins and ends in the city of Bordeaux, mooring right on the newly redeveloped and iconic waterfront. The historic buildings are lit up at night, creating an extraordinary backdrop for cocktails and conversation on Tango’s deck. Let the moonlight dancing begin — on the barge Tango in Bordeaux! In the afternoon, you will be met by a crew member of the Tango at the designated meeting point. 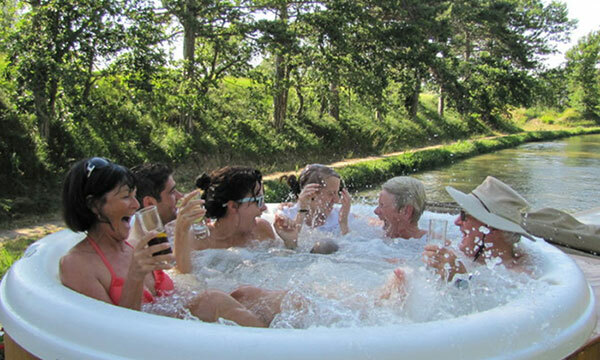 From here, relax as you are chauffeured to the barge, moored in Bordeaux city. A traditional champagne welcome and introduction to the crew awaits you, before a sunset cruise and your first gourmet dinner onboard. This morning, a leisurely cruise culminates at one Bordeaux's most celebrated attractions, the Cité du Vin. Immersive exhibits focusing on the area's fabled wines are housed in a space-age architectural complex, offering one of the most pleasurable ways to learn about the elegant elixirs produced by this beloved region. Celebrate your new oenological expertise with a private dégustation in a gorgeous tasting room, then return to the barge for an afternoon cruise. Relax on deck and admire the scenery slipping by. Dinner is served onboard. This is the land of the extraordinary wines created in the mythic terrains of Pauillac, Saint-Julien, and Margaux. Because of geology, location, soil, and sun, this area has wines that are, in many cases, totally distinct from one another. This morning, your Tour Guide will lead you through these renowned vineyards for a full day of tasting and touring. As a special treat, lunch is taken ashore at the exceptionally picturesque Chateau Beychevelle in the Saint-Julien commune. Return to the barge for an evening cruise and dinner onboard. Once a disputed hotspot over hundreds of years, and destroyed by Protestant forces in the late 16th century, the town of Blaye boasts an intact military fortress, The Citadel of Blaye. Designed between 1685 -1689, this astonishing edifice expands a total area of 38 hectares. Enjoy a guided tour of the site, followed by a visit to a lively street market. Return to the barge for an afternoon cruise, floating past picturesque fishing huts and sumptuous mansions. Upon mooring, enjoy a gentle pedal or leisurely stroll. Drinks and dinner are onboard. 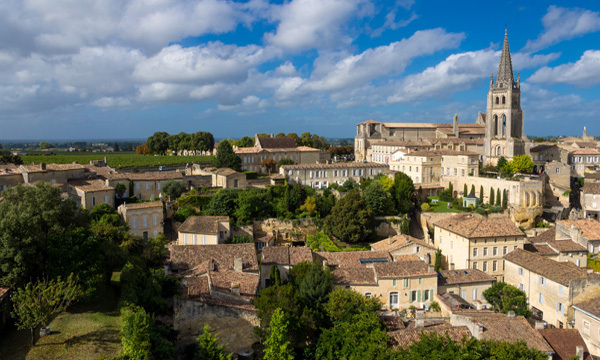 This morning, your Tour Guide chauffeurs you to the medieval village of Saint-Emilion where grapes have been cultivated for winemaking purposes since the Gallo-Roman era. Visit the 14th century Cloisters of the Collegiate Church, browse the shops in the pedestrian area, and enjoy a coffee in the town square. A visit to a hillside domain for a tour and tasting follows. Return to the Tango for another afternoon cruise. Socialize in the salon, lounge on deck in the hot tub, or visit the Captain in his wheelhouse. Chef presents dinner onboard. A guided walking tour of Bourg begins the day's adventures. Many pleasures and treasures are here: the GalloRoman fountain; local antique shops; and, most intriguingly, a museum of horse-drawn carriages. Your Tour Guide returns you to the barge for an afternoon cruise. Upon mooring, you will board a water-taxi to the center of Bordeaux City. Admire the wonderful Water Mirror reflecting pool, and then feel free to meander through the city's charming avenues and boutique-lined boulevards. Tonight, Chef serves a memorable Farewell Feast onboard. After breakfast, you will be chauffeured to the designated drop off point in Bordeaux City.